Harold Shaw, the new head of the FBI in Boston, pledged to partner with local authorities and other federal agencies to tackle gun crimes, drug dealing and terrorism. Shaw took over the Boston office in October and said his experience in counter-terrorism will help crack down on extremists. “The tricks of the trade I learned were from the task-force partners who were doing it a lot longer than I was,” he said. 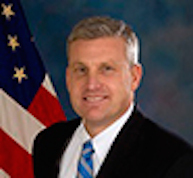 Shaw replaced Vincent Lisi, who retired to join the private sector in August. Posted: 2/8/16 at 8:51 AM under News Story.